I don’t get it. What’s racist about that advertisement? There cannot be racism in China because China has no black people. Everybody says so. Nah. Not racist, just market reality. Just one question : 外教 doesn’t mean foreign teacher ? In this case, does it mean teacher of foreign language ? It does. Sorry if that was unclear. Pdwalker, absolutely agree with you. there is not racist, they just proud to use foreigners. 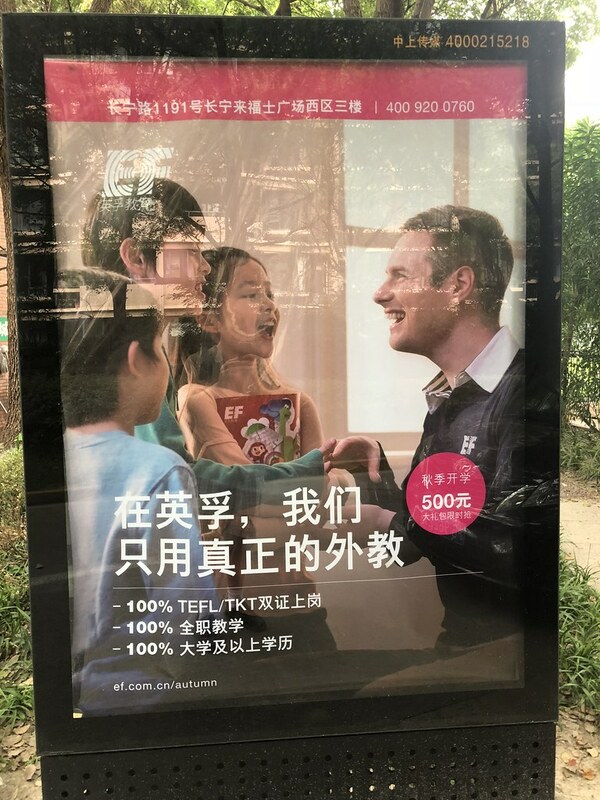 I work in China as guest service manager in a hotel, and you know they hired me just because I have European face, i cannot speak Chinese, i cannot solve incoming problems from our guests, but for them just important my white face. I know a case when Chinese English school hired some people from Russia and ex-Soviet countries without high quality knowledges of English. So my conclusion Chinese reflect Europe and US centrism through this way.